Riders are invariably impressed with the beauty of the land, the great riding, and the cultural riches of the continent. English is the dominant language and is widely understood in all but small, rural communities. Nothing impresses our guests more than the friendly and welcoming attitude of the African people. A rider once told us that she felt like a visiting dignitary because so many people along the road provided cheerful waves as we rode by. Riders are invariably impressed with the beauty of the land, the great riding, and the cultural riches of the continent. English is the dominant language and is widely understood in all but small, rural communities. Nothing impresses our guests more than the friendly and welcoming attitude of the African people. A rider once told us that she felt like a visiting dignitary because so many people along the road provided cheerful waves as we rode by them. All of our scheduled Africa tours take place on paved roads. If you are interested in off-road riding, several of our private tours are specifically designed for riding off-the-pavement. In Africa you’ll ride on the left. You may ride with a tour leader during the entire trip if you wish, or you may venture forth on your own. We encourage riders who aren’t familiar with riding on the left to stick with a tour leader, at least for the first day or two. Switching sides isn’t particularly difficult once you become accustomed to differences in making turns at intersections and in handling traffic circles. We think it would be a pity to travel all the way to Africa and not have an opportunity to experience the continent’s wildlife. Most of our Africa Adventures include planned wildlife experiences, conducted from the safety and comfort of specially-equipped Land Rover safari and game viewing vehicles. Some of our “jaw dropping” photos depicting wildlife were taken while riding in a safari vehicle, as we avoid riding our motorcycles in areas where we’re likely to encounter predators or aggressive animals. On many of our Adventures we see elephant, giraffe, zebra, kudu and other wildlife along the road, but we exercise caution and don’t attempt to approach them. It’s exciting enough just to photograph them! 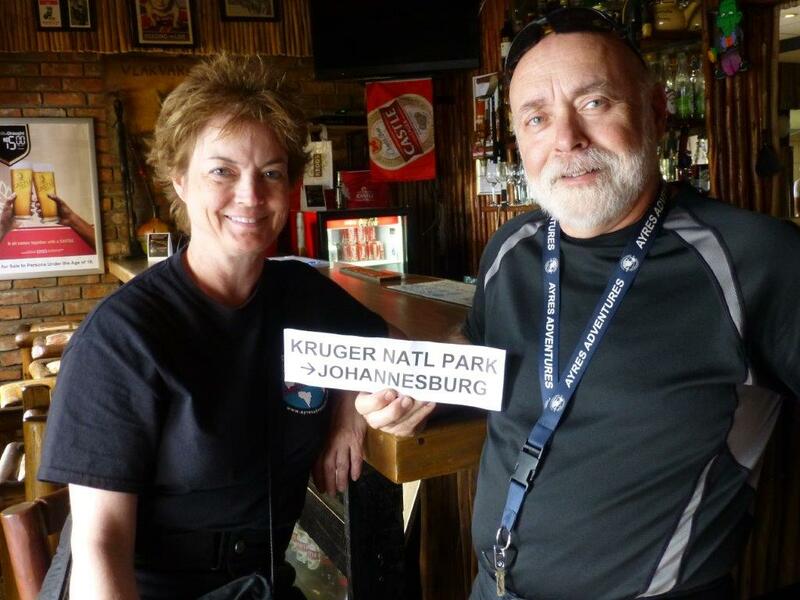 Our customers have found travel in Africa to be surprisingly unique, incredibly beautiful and adventuresome. Most describe it as the experience of a lifetime. More of our customers make return trips to Africa with us than to any other destination. On many of our tours, we use upscale game lodges for overnight stays inside popular game reserves. Spending several evenings under the stars in the African bush is an indescribable experience that is often the highlight of an African Adventure.